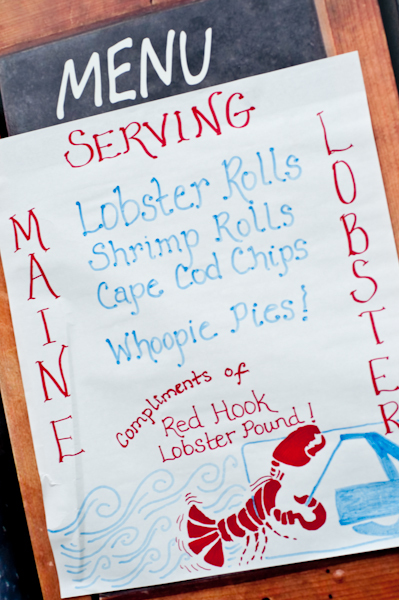 “It’s as close to Maine as you’re going to get in Washington.” Red Hook Lobster Pound founder/owner Ralph Gorham of Brooklyn, NY, was right about that. Well, almost right. His lobster roll was better than the one I had in Portland. On a business trip a few years ago, I asked the locals where to find the best lobster roll. I went to a waterfront restaurant and enjoyed a lovely roll with fresh, chopped meat covered in not-too-much mayonnaise for an affordable $17. Pretty tasty. Red Hook one-ups their neighbors to the north by making their rolls with the finest claw and knuckle meat. I tried the new lobstah-on-wheels concept at a preview party in Southwest D.C. near Nationals Park. 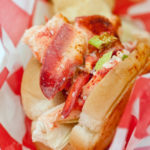 The Brooklyn-based “wharf-style lobster shack” will now be available in D.C. as a new food truck concept. At the tasting, I was delighted to find an entire claw – an entire claw! – in my roll. And the meat isn’t drowned in schmaltz, either. There’s a fine coating of house-made mayo (optional), celery and spices. A scrumptious roll goes for $15 alone, but for $18 you also get Cape Cod potato chips – a personal favorite – a crunchy pickle and Maine Root “organically sweetened” soda. Shrimp rolls and incredible homemade whoopie pies are also on the menu. 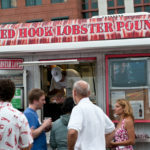 Red Hook Lobster Pound is a family-run business – the D.C. food truck is operated by Gorham’s relatives – which he founded with wife Susan Povich “a couple of years ago on a family trip to Maine” to provide a Maine experience in Brooklyn, New York. Gorham owns a building in Brooklyn out of which he runs a furniture business and found himself with an open storefront that needed to be used to provide supplemental income. “I did this just to pay the electric bill,” he said. “Now we do catering and private parties.” Catering will be a part of the D.C. operation as well. 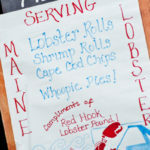 Gorham said that the ingredients are the key to an authentic lobster roll. “It’s all about the meat and the bread.” To ensure quality, he drives to Maine to purchase the best lobster meat, inspecting it personally. And it’s not a Maine lobster roll without J.J. Nissen buns. The rolls are seasoned with Lakeland Salted Butter. While the butter adds more than flavor – ahem, calories – lobster and shrimp alone are relatively low in calories and saturated fat and great sources of nutrient-rich protein. At the event, the owners announced that customers can donate 25 cents from each roll to D.C.-area food banks and other food-related charities, and Red Hook will match each donation. Customers will also be asked to chime in on Twitter and Facebook to let them know which area of Washington they’d like to see the truck. Watch those pages to find out where the lobster truck will land next.